The Trojan Horse, in lore about the Trojan War was a huge wooden horse (Δούρειος Ἵππος, Doúreios Híppos), which hid a select force of warriors inside, used by the Greeks as a subterfuge to gain entrance to the city of Troy. After a fruitless 10-year siege, the Greek armies left it before the gates of the city and sailed away. The Trojans then pulled the horse into their city as a victory trophy, and those inside crept out of the horse in the night and opened the gates for the rest of the Greek forces, which had sailed back under cover of darkness. The Greeks entered and destroyed the city of Troy, decisively ending the war. The idea was conceived by Odysseus, supported by the seer Calchas and built by Epeius. 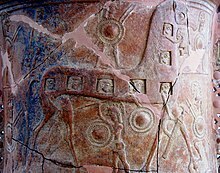 Metaphorically a "Trojan Horse" has come to mean any trick or stratagem that causes a target to invite a foe into a securely protected bastion or place, thus a malicious computer program which tricks users into willingly running it is also called a "Trojan horse". Do not trust the horse, Trojans. The emigres often work as a Trojan horse, lobbying on your behalf. They use external opportunities to succeed prodigiously in different occupations. And they can bring their skills and funds home to assist the country in its economic takeoff. Reagan's theory was really "trickle down" economics borrowed from the Republican 1920s (Harding-Coolidge-Hoover) and renamed "supply side." Cut tax rates for the wealthy; everyone else will benefit. As Reagan's budget director David Stockman confided to me at the time, the supply-side rhetoric "was always a Trojan horse to bring down the top rate." Many middle-class and poor citizens figured it out, even if reporters did not. Every collectivist revolution rides in on a Trojan horse of "Emergency". It was a tactic of Lenin, Hitler and Mussolini. In the collectivist sweep over a dozen minor countries of Europe, it was the cry of men striving to get on horseback. And "Emergence" became the justification of the subsequent steps. This technique of creating emergency is the greatest achievement that demagoguery attains. The invasion of New Deal Collectivism was introduced by this same Trojan Horse. I put it to you, Minister, that you are looking a Trojan horse in the mouth. Politics: a Trojan horse race. Songs can be Trojan horses, taking charged ideas and sneaking past the ego's defenses and into the open mind. If the establishment of an "unlimited" treaty power is to be the ultimate conclusion on this great question, it must be admitted that the incorporation of the treaty-making power into the Constitution of the United States was the introduction into our governmental citadel of a Trojan horse, whose armored soldiery, for years concealed within it, now step forth armed cap-à-pie, shameless in their act of deception, eager and ready to capture the citadel upon which they pretended to bestow their gift. If such construction be possible it would be of interest to know for what purpose the Tenth Amendment was ever demanded and incorporated into the Constitution. Whatever it is, I fear the Greeks even when they bring gifts. Virgil, in the Aeneid (c. 29 - 19 BC), II, 4; this has often been paraphrased as "Beware of Greeks bearing gifts." This page was last edited on 7 May 2018, at 05:34.